At GoFi8ure, we offer accounting services to contractors, sole traders, partnerships, SME’s, companies, and Not-for-Profits in the Wellington, Hutt Valley, Auckland, and Dunedin regions. We offer a wide range of financial management services too and are experts in financial matters, tax returns and compliance, payroll accounting and property investment throughout New Zealand. Knowing what the tax implications are of the business decisions you make is really important, so knowing that your advisor is only a phone call or meeting away will give you peace of mind. Our in-house tax experts and tax accountants work across our team of advisors to make sure that the tax planning and strategy for each client are effective. Whether you are undergoing a major change in your business and need a tax opinion on the impact, or just want to know that your advisor has everything tax-related in hand, we are the team for you. Not only are we one of the top accounting firms in Wellington, but we are also proud members of the Accountants and Tax Agents Institute of New Zealand (ATAINZ) and a recognised Tax Agent with Inland Revenue. Being on top of your tax obligations is fundamental to the growth of your business. We will help you avoid surprises and stay on top of the ever-changing tax landscape so you do not have to by being a Tax Accountant that you can rely on. We strive to help you achieve your goals by delivering professional work, and in a timely manner using the tools available and the experience our team provides. If you are in need of a small business, Xero or MYOB Accountant, look no further than the professional and reliable team at GoFi8ure. Need advice and assistance with Tax Returns? Leave your personal and business tax to us. Get the peace of mind you need by knowing you have accurate financials to make decisions and meet compliance requirements. Most of you will know of, or have heard of GoFi8ure and our accounting services from social media, articles, networking opportunities, or the Wellington Business Expo. Whilst accounting is our core service offering and what we excel at, we are also passionate about other key areas that can help you in business. One of these areas is helping business owners file their Business and Personal Tax Returns. + Are you a small business wanting to get your life back? + Are Debtors driving you crazy? + Is GST and PAYE doing your head in? + Do you need accounting help but can’t afford staff? + Is invoicing taking too much time? + Do you never have enough hours in the day? We are the cost effective solution to your problems. We can help small and medium sized businesses with quality and efficient bookkeeping solutions. GoFi8ure are a cost effective accounting solution for small to medium sized New Zealand businesses. Our main offices are based in the Wellington CBD, Hutt Valley, Auckland and Dunedin, but you don’t have to be. Utilising the latest technologies, including cloud-based software solutions, we can provide accounting support to our customers nationwide. 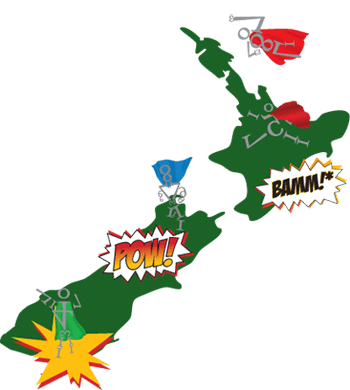 The best thing about our service is that we have GoFi8urines nationwide who can travel to you whether you are located in Wellington, Hutt Valley, Wairarapa, Auckland or Dunedin. We also provide cloud-based services nationwide. This could be your best year yet, so are you ready to make the move? We can help your business grow and ensure your finances are always accurate for less than the cost of an office worker, for as little as one day per week!